The mercurial rise of Liines takes another step forward with their first sold-out show in Manchester with 200 people crammed into the new Night People venue to celebrate the fast-rising band. Liines dislocated post-punk has now hit perfection – the three-piece have hit on a perfectly measured sound that combines the rhythmic propulsive drumming hooked around death disco beats and a perfect running bass with the guitar doing the shrapnel thing over the top. Think Delta 5 but for the now. 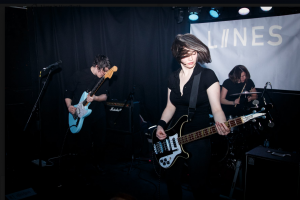 Liines are a perfect band for the moment – they have a raw edge but their super tight rhythm section is a perfect engine room for dancing – a punk-funk powerhouse, a dislocated rhythm machine, a dirty disco angular trio – they are on fire and they are stunning. And they turn this into a modern pop with vocals that are impassioned but melodic with their minimalistic clipped sonic assault delivering a set of perfect songs that are full of ideas and space. It can’t be long before the word gets out and Liines become a byword for the sassy and thrilling modern and a soundtrack for the now and one of those bands that define 6music. By xmas, they will be that band. The support bands on a packed bill are The 99 Degree whose scuzzy reverb drenched fuzz garage is like the Gun Club with a hangover – a disheveled rock n roll with seat of the pants, daredevil riffola, garage clatter and Link Wray dervish licks and a charismatic frontman who has got the caveman stomp down to perfection. First on are Lynchs who astonishingly are only playing their sixth gig with a set of tight and perfect songs that hint at the melancholic eccentricity of British Sea Power or the high IQ, arch, guitar rushes of a Monochrome Set and a whole host of late seventies that they surely can’t have heard of. The band all look about 16 – skinny rats in sharp linear post-punk clothes and songs to match. The drums are tight – more disco punk 4/4 bass drum throb and the guitars tread the line between discord and jangle – maybe raising an eyebrow to Johnny Marr when he turns his attention to the left field end of the indie times. Great songs and a cool detached attitude – there is something quite special about Lynchs and they are well worth keeping an eye on.